If you live in Seattle and happen to drive a Jeep, one of the first things you do when the weather finally acts like it might be summer, is take your top down. (And, if you are my husband, take your doors off.) I have to admit that there is something quite wonderful about driving around town, doing errands with the wind blowing through your hair, and the warm sun shining down on you. I had just climbed back into the Jeep when I noticed something strange in the cup-holder. 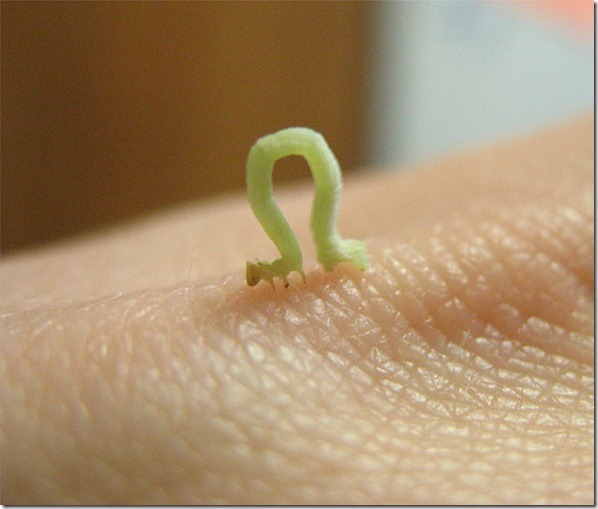 On closer examination, I realized it was a little, bitty green worm! As much as the tiny creature grossed me out (Seriously…it was a worm, after all!) the thought that some little guy had fallen into our Jeep to it’s certain death made me sad. Shaun bravely picked the little worm up and looked closely at him. He was delighted when he realized we had a very much alive inch worm hitch-hiking in the Jeep. After playing with him for a moment, my Beloved wondered what we should do with him. Obviously I we didn’t want to keep him in the vehicle, but putting him down in the parking lot was a certain death. I spotted a small grassy area a little ways off and suggested we release him there. Of course, Shaun thought that it was a brilliant idea. He then gently placed the worm in my hand and drove over to it. When we got to the grassy clump, I gingerly place the little guy on a blade of the tall grass and wished him well. Shaun and I simultaneously shouted out “You’re Free!” We looked at each other, then burst into peals of laughter at our similar thoughts. This entry was posted in It's all about me!, Love and Marriage, That Man O' Mine and tagged 4th of July, bravery, inch worm, Jeep, worm. Bookmark the permalink. I have a couple of spiders downstairs you guys could come rescue! I think we need to have a coffee soon….hubs and I are definitely doing something wrong in that department so I need your expertise. I’m the one that picks up wormies and such – though I must admit he is great at killing spiders in the house. Glad you had a good holiday! Whoopsie – forgot to give you the link…. we are pretty blessed in the northwest to have comparably small bugs.